Back in 1936, Suppose U Drive was founded. 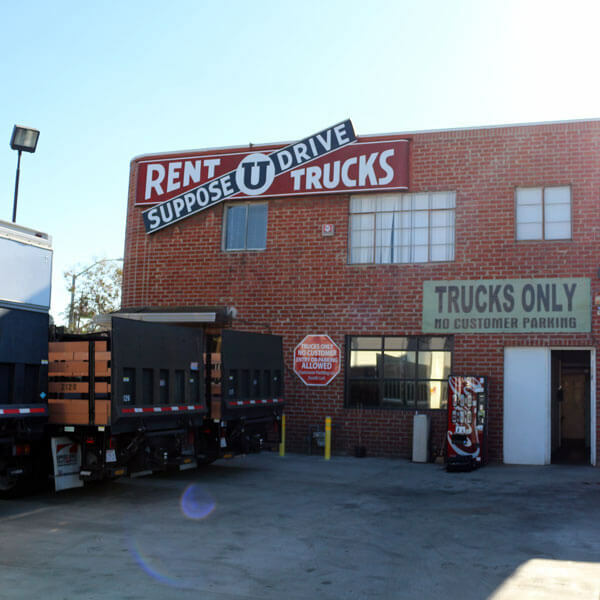 The very first location was placed in Glendale, California and would later become one of three lots. The “Gateway to the Valley”, as it’s known, continues to be the host of one of Suppose U Drive’s busiest lots. This 1-acre location primarily services the studio industry, which includes any studio related. In fact, it’s very likely that our Glendale location has in some way contributed to the making of your favorite movie, show, or commercial. After all, we are Hollywood’s #1 trucking company. Navigating to the Glendale location is simple, as it’s located near the scenic Griffith Park and a mile from the iconic Americana. Just like with any of our lots, you’ll experience the unmatched quality of service and strict equipment standards that set us apart from the rest. Our on-site full washing service and fuel tanks allow us to get every vehicle back on the road quickly, without delay. And, our extensively trained staff know that the top priority is always exceeding our high customer satisfaction and safety standards. Rather than pressuring you into a contract like many of our competitors, our goal is helping you make the best decision for your business. By listening to your needs, our professional sales team will be able to guide you through our inventory and help you locate the best vehicle for your next project. Plus, our flexible rental and leasing options can scale to fit your business, whether you need one vehicle or ten. You can use a vehicle for as little as one day, or even an entire year or more. And, if you need it sooner rather than later, you’ll also be glad to know that Suppose U Drive offers the fastest checkout service in the industry. While our competitors will have you wait up to half an hour while they take care of last-minute cleaning and fueling, our crews are trained to get these items off the checklist as soon as a vehicle is brought back to our lot. That means you can drive off and get back to work in a matter of minutes. Stop by our Glendale location today and see the different quality makes.